On that special day, the special person can be overwhelmed by the sheer volume of floral gifts. And there are special people you want to give flowers to, but you would like to leave it up to them to choose whatever they want, whenever they want. In these and in many other instances, gift cards are the ideal alternative. The Fleurop gift cards are valid for two years as of date of purchase. They may not be redeemed for cash, neither in full nor in part. Fleurop is not liable for lost, stolen or damaged and thus illegible gift cards. 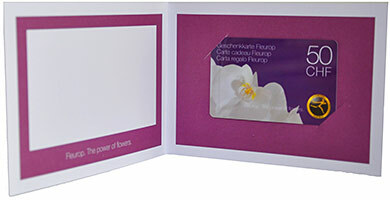 Fleurop gift cards come with a matching presentation folder and a separate white envelope. The presentation folder not only specifies the validity date, it also features a text field for your name and personal message to the recipient. Note that your name does not automatically appear on the gift card or presentation folder. Fleurop gift cards can be purchased at Fleurop partner shops in Switzerland, online and by e-mail ([email protected]). The handy Fleurop gift cards can be used at all Fleurop partner shops in Switzerland and online in the Fleurop webshop. Order Fleurop gift cards HERE.